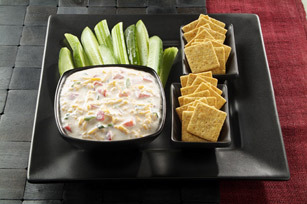 Served with crackers, this cream cheese, shredded Cheddar and bell pepper dip makes a delicious appetizer or snack. Beat reduced-fat cream cheese and milk with mixer until blended. Add cheddar; mix well. Stir in peppers and onions. Serve dip in a hollowed-out green or red bell pepper. Dip can also be served with cut-up fresh vegetables. Garnish with additional chopped red peppers and sliced green onions.